WASHINGTON (AP) — Wizards guard Bradley Beal had to be helped off the court Friday during a loss in Minnesota. A night later, he was back to help lead a rout of the Detroit Pistons. John Wall had 20 points and 11 assists, and Beal scored 10 of his 15 points during the second quarter as Washington pulled away for a 106-82 victory on Saturday. Marcin Gortat scored 16 points, and Trevor Ariza added 15 points for Washington, which snapped a three-game home losing streak and has won four of its last five overall. Beal left in the fourth quarter Friday after colliding with Timberwolves forward Luc Mbah a Moute. An MRI Saturday was negative and Beal started against Detroit and played 20 minutes. "I woke up this morning feeling good, so I was hopeful that would be a good sign throughout the day," Beal said. "The (doctor) told me it was nothing but a little bone bruise. It’s going to take a little bit more than that to keep me from playing. And it didn’t hurt tonight, so that’s a good thing." One night after their worst defeat of the season, a 22-point loss to the Wolves, the Wizards never trailed, pulling away late in the first half and posting their biggest margin of victory this season. "We got back a little bit of our identity that I thought we lost last night coming out of Christmas break," coach Randy Wittman said. "We can only play one way, and that’s a physical presence on the floor. Tonight was more the team that we have to be. I thought that right from the jump ball we took the fight in a physical manner that we didn’t at all last night." Greg Monroe scored 14 points and Brandon Jennings had 13 for Detroit, which has dropped four of five. Detroit coach Maurice Cheeks kept starting forward Josh Smith, who had five points in Friday’s loss at Orlando and shot 2 of 7 in the first half against the Wizards, on the bench for the second half. "I just felt like I wanted to make a change and stay with the guys I went with," Cheeks said. "It wasn’t just him. (Kentavious Caldwell-Pope) didn’t start either." Caldwell-Pope eventually played nearly 10 minutes of the second half. "I mean it’s unfair because like I told you before, I play the game hard each and every day," Smith said when asked if he was being singled out. "When I was younger I played this game free year around. So why wouldn’t I want to come out here and put my best foot forward every time I step out?" The Wizards took an 11-point lead in the first quarter as Gortat scored 10 points. Detroit pulled within 42-37 midway through the second quarter on a basket by Will Bynum, but Washington went on a 20-4 run to end the half, capped by two 3-pointers from Beal and a reverse dunk by Wall. "Those were two great finds by John," Beal said. "He saw I hit the first one and he came right back to me. That just shows his IQ and the connection we both have, and he got me going." Wall had 10 points in the quarter as well, and Washington scored a season-high 62 points in the first half. The Pistons went scoreless for the final 4:53 of the quarter and shot 37 percent for the half. Washington meanwhile, hit 25 of 44 field goals (57 percent) in the first 24 minutes. "Our transition defense has been bad. Our interior defense has been bad," Cheeks said. "When you have a team that is shooting well from the three and getting inside the paint, a lot of things are going to give and we need to recover." 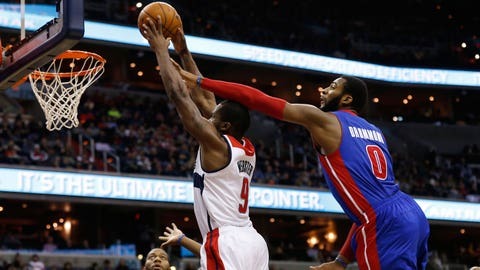 Detroit got no closer than 19 points in the second half and the Wizards led by as many as 28. "Being aggressive, attacking the basket, being more physical," Wall said of the win. "We got back to our defensive concepts and we protected the rim and got a lot or rebounds." The Wizards collected 34 assists. They outrebounded Detroit 46-38 and limited the Pistons to 11 offensive rebounds. Wall has scored 20 or more points in a career-high six consecutive games and it was his 10th double-double of the season. NOTES: Beal, who came in averaging 19.2 points, missed nine games this season with a stress fracture in his right leg. . Washington had lost seven straight to the Pistons since beating them Feb. 12, 2012. . The teams play Monday in Detroit. . Swati and Zaziwe Mandela, granddaughters of the late Nelson Mandela, took part in ceremony with District of Columbia Mayor Vincent Gray and Wizards owner Ted Leonsis before the game.